I’ve been interested in maps since forever. When I was younger I had maps of The World, Europe, the US, and various archipelagos and islands pinned to my wall in Pasadena, Texas, reminding me every day that there was a big ol’ world out there beyond southeastern Texas. At some point I went through my grandmother’s collection of National Geographics and stole as many maps from that magazine as I could. Years later, when I was in high school, my grandmother mailed to me a box of the ones I apparently missed. Being a nerd, I was into Dungeons & Dragons, of course, and I only played “dungeon master” merely so I could create the myths and especially draw the detailed maps of fictional worlds that the players were forced to explore. Later on, in my San Francisco apartment, I had USGS survey maps of various national parks (Yosemite Valley and the Grand Canyon most memorably), a bus map of Paris, and an old map of the New York City Subway. I ended up spending two years of college in New York, so eventually it all came pretty naturally. I also spent a year of college (and then another year afterward) in Paris, where the system is much simpler and the Paris Métro map reflects that. Still, I was always very aware of the frequent visitor to the city, standing out in a crowd of New Yorkers, staring at that map — either on the wall of the station or on the platform of the train — looking like they were lost or soon would be. Now, fast forward a couple of years to, say, 2010. I’m working on this series of big books about transportation for HarperCollins called Everything Goes. I’m writing about and drawing as many different types of vehicles as I can cram into three books. And while it looks like I’m not going to be able to get many references to maps in as I’d originally hoped, I have spent a good deal of time reading about and looking at transit maps. It was during this research that I found (just chanced upon actually) a book called Paris Underground: The Maps, Stations and Design of the Métro (Amazon link here) by Mark Ovenden. The book includes maps of the Métro since its inception in 1900, as well as photographs of the stations and the various printed ephemera, like tickets and brochures, that have been used by the RATP (Régie Autonome des Transports Parisiens) over the years. It’s really a terrific book. The cover of that book lists Ovenden as the author of another book called Transit Maps of the World (Amazon link), which I of course promptly ordered. This book is just as good, with both historical and current maps of dozens of subway systems from all over. Paris and New York, of course, but also Hamburg, Mexico City, Montreal, Osaka, and even good ol’ Philadelphia. These maps do the same thing for me as the maps I had on my wall when I was twelve. I love following the routes and seeing the names of the stops and imagining what one sees when one emerges from underground at that point. When I loved in Paris, it was a cheap thrill to take the Métro to some unknown station and explore the neighborhood it served, then find my way home again. This daydreaming, I suppose, is a virtual version of the same. Me in the Paris Métro, 2004. This all came about today because The New York Times published an article this morning about a new edition of the aforementioned subway map that will be introduced next week. Each time a city updated its transit maps, various controversies ensue as certain elements are simplified or removed, others are added or enlarged, and the process of trying to please everyone including locals as well as tourists ends up making everyone unhappy. In this case, Manhattan, being the busiest and most congested borough of the city, has been enlarged (engorged actually, it’s really fat) while Staten Island, with its sole tendril of a line running from St. George to Tottenville, has been stuffed into a small box and shrunk down in size. I’m sure the residents of Staten Island are insulted, even though, really, the move makes sense. The NYTimes story has a terrific (but too small!) interactive feature detailing ways in which the map has changed from the current edition to the new one. Go see that here. Poking around the Googles this morning led me to a couple of other interesting places as well. The Metro Transit Authority (MTA) which is the agency that oversees the subway and bus system of NY has a maps section of their site that’s pretty slick. The Paris RATP’s site has the Métro map available for PDF download here and a smaller “wallet size” edition here. (watch it, the links open the PDF maps). My new favorite time-waster: An interactive map of the Paris Métro. If you know of any more interesting sites and resources, leave a comment! 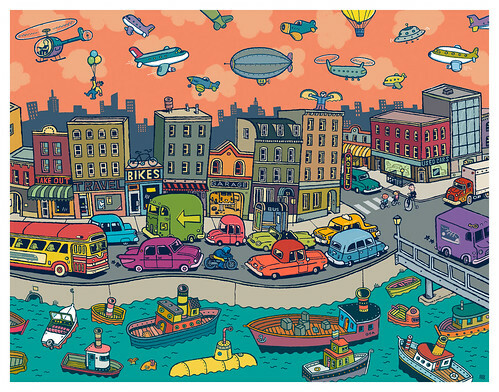 A while back I made a big puzzle for Mudpuppy with the theme “Air, Land, and Sea.” Recently they asked me to make another puzzle, a little smaller for the 3+ crowd, with more cars. Last night this thing got finished and will be out June 2009. 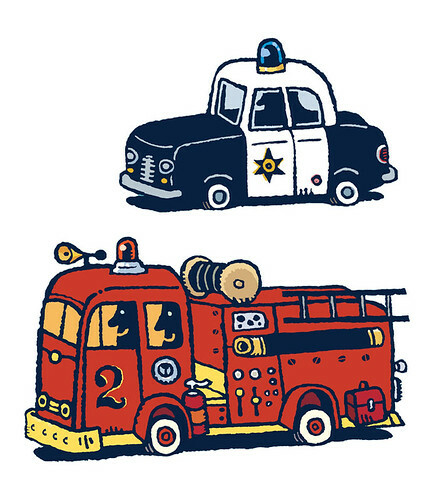 As you probably know, I really really like drawing cars and trucks and things that go. Last year I made an illustration for Mudpuppy, art directed by the amazing Lorena Siminovich, called Air, Land, and Sea. Basically, aircraft, autos, and boats. I’ve been dying to see this and it looks like it’s finally out! I don’t have my samples yet so if you have this or you’ve seen it let me know how it looks. There is a puzzle, stationery, and a play set. Collect them all! Just drew these today for the playscene version of that city-scape for Mudpuppy. If someone came along and said “Brian, for the rest of eternity, you are only allowed to draw cars, boats, airplanes and robots,” I’d be ok with that. Just today finished an illustration for a company called Mudpuppy, art directed by Lorena Siminovich. It will be published in about a year (Spring 08) in the form of a puzzle. The theme was “air, land and sea” and it was directly inspired by my book from 2004 “Un Mode de Transport” published by Le Rouergue. Stay tuned for more on this in, oh, about a year.